Join Kristy Titus in the latest episode of Pursue The Wild where she returns to the Northwest Territories Canada for Part 2 of her pursuit of Dall Sheep with Mackenzie Mountain Outfitters. The stories told of the Mackenzie Mountains are captivating. There is a legacy that lives within them as every time they are told, they pass along the torch of desire from one hunter on to another. Creating a fire within that cannot be ignored. The stories; they take you North. Join Kristy Titus in the latest episode of Pursue The Wild where she heads to the Northwest Territories Canada in pursuit of Dall Sheep with Mackenzie Mountain Outfitters. Join Kristy Titus in the latest episode of Pursue The Wild where she returns to Colorado, to one of her favorite late season elk hunting spots on the Rocky Mountain Front. A properly fitted rifle is sure to make any day at the range or afield more fun and successful by allowing the shooter to deliver well-placed shots. In the latest episode of Pursue The Wild, Tips From The Wild, join Kristy Titus as she discusses correctly fitting your personal rifle from length of pull, cheek comb height and optic eye relief. Also, showcasing a few of her favorite Ruger rifle platforms that come out of the box with adjustability. Warm, roomy, a big foot box, and the ability to pack down to nothing. Less weight and bulk. The industry leading Kifaru Slick Bag has the best warmth to weight ratio on the market, combined with Rhino Skin fabric to produce a bag that is extremely compact when stored, yet lofts up to deliver lifesaving warmth. In the latest episode of Pursue The Wild, Tips From The Wild, join Kristy Titus and Frank Peralta of Kifaru International to break down how slick the Kifaru Slick Bag really is. Rifle elk hunting in the Colorado Rockies can hold some of the same thrills found in the peak of the rut from screaming bulls to close encounters. Stay tuned for this action packed elk hunt with Kristy Titus and Marty Pachelli. Originally airing on RMEF's Team Elk Television Show. The modern sporting rifle is extremely versatile. It has light recoil and superior adjustability making it an ideal choice for anyone that wants to plink, target shoot, hunt, for law enforcement training and self-defense. In this episode of Pursue The Wild, Tips From The Wild, Kristy Titus showcases the American made, Hornady Frontier Cartridge. Cabela's & Bass Pro Shops Fall Hunting Classic was August 10-26 and to kick off the biggest sale of the fall, I was at Bass Pro Shops in Nashville TN Sunday August 12 from 12-4 showcasing some of my favorite gear from Ruger, Nightforce Optics, Obsession Bows, Ramcat Broadheads, Trophy Taker, Dead Down Wind, Tinks, Buck Knives and more! It was so fun helping one hunter select a new Nightforce SHV F1 scope and several pick out the right Hornady ammunition for their next big game hunt! I love these events. It was another great weekend at the 4th Annual Craig Family Camp Womens Shooting Clinic where over 70 ladies learned to shoot, shotgun, pistol, rifle, gun cleaning & concealed carry options. The camp is supported by the community volunteers that work hard to ensure attendees have an outstanding experience. Support to the event was also given by Rocky Mountain Elk Foundation, Cabela's, Bass Pro Shops & Buck Knives. Many of the ladies had never shot a firearm and some hadn’t in over 40 years. Everyone left with big smiles and a sense of new found confidence & empowerment. Thank you to the First Lady of Indiana, the Governor’s wife Janet Holcomb, and State Representatives Peggy Mayfield & Jeff Ellington for attending and volunteering supporting our Second Amendment and legal firearms owners. It was a great weekend shooting the New England Precision Rifle Seriesmatch with my crew from Ruger including our shooting team captain Doug Koenig, and my friend Laura Evans from Nightforce Optics volunteered as an RO. A huge congratulations to Ruger Engineer Jonathan Mather for winning the Production Division for the second year in a row! Doug finished out in 17th place and I ended with 39th out of 110 shooters. My gear is better than ever with my 6mm Creedmoor RPR which shooting lights out topped with my Nightforce Optics ATACR scope and Hornady 108gr ELD Match. This match was my top placing finish of the season at a national match. My original goal this season was to finish in the 50th percentile of shooters which I constantly maintained. This match I made the top 1/3! Thanks to my coach Jake Vibbert I have made a lot of progress as a first year competitor over the past few months but I’ve got a lot of work to do. I’m looking forward to training up for the 2019 season over the fall between hunts. 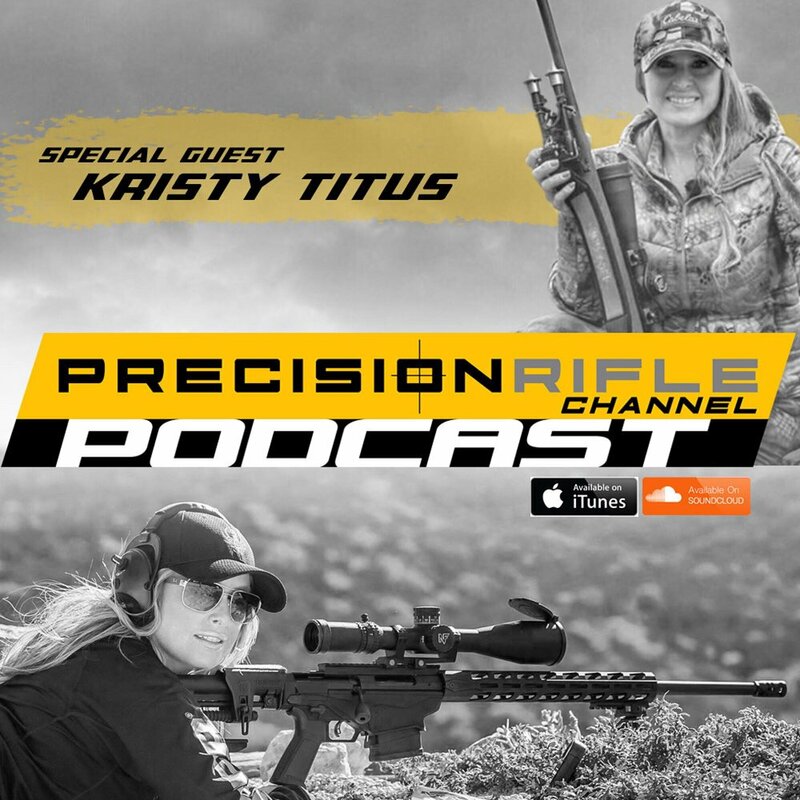 On today’s special episode of Precision Rifle Channel Podcast, Travis invites “Pursue The Wild” host, Kristy Titus, to the podcast! 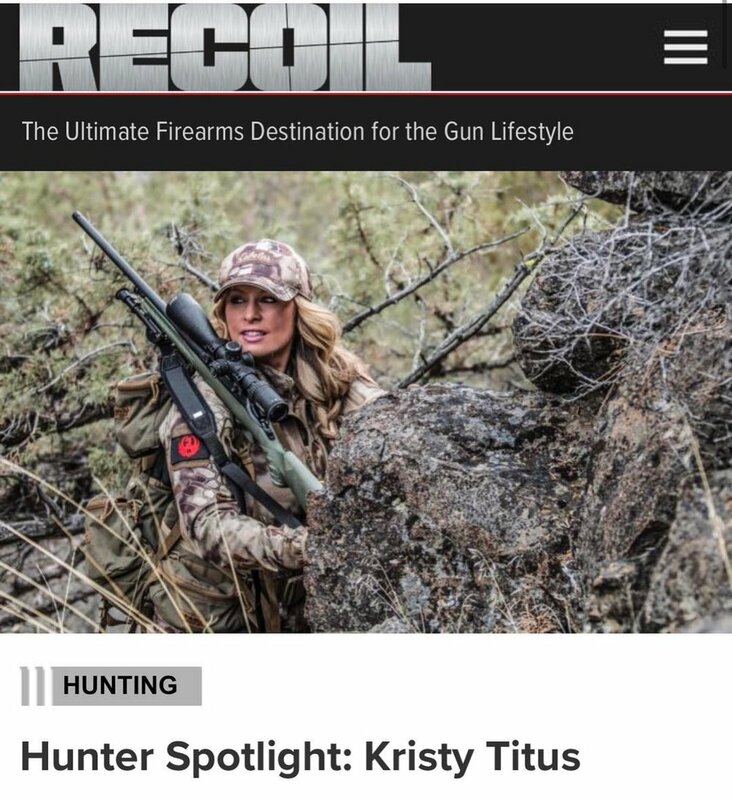 Here are just a few things listed on Kristy’s extensive resume: She’s part of the NRA Board of Directors, is a successful shooting instructor and hunter, stars in her own digital series ‘Pursue The Wild’, and serves as a brand ambassador for many companies like Ruger, The Rocky Mountain Elk Foundation, Nightforce Optics, and many more! 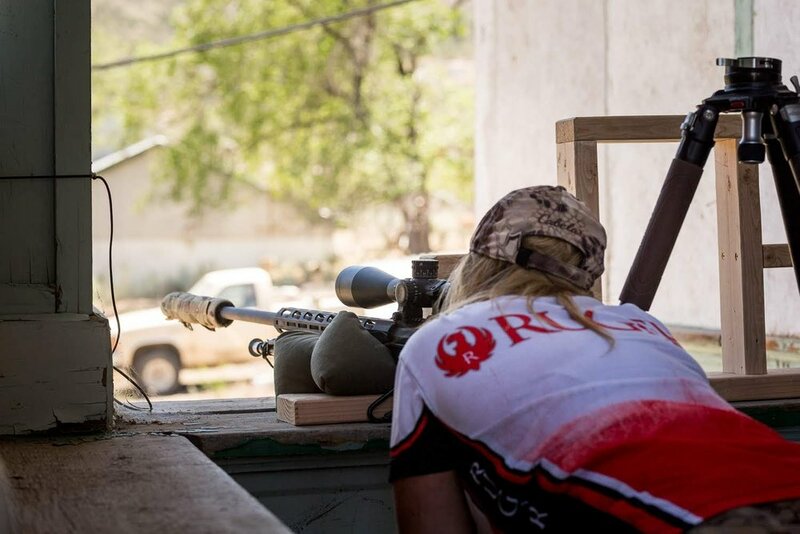 Learn more about Kristy, her shooting career, her advice for female shooters in the sport, and more on the PRC Podcast! 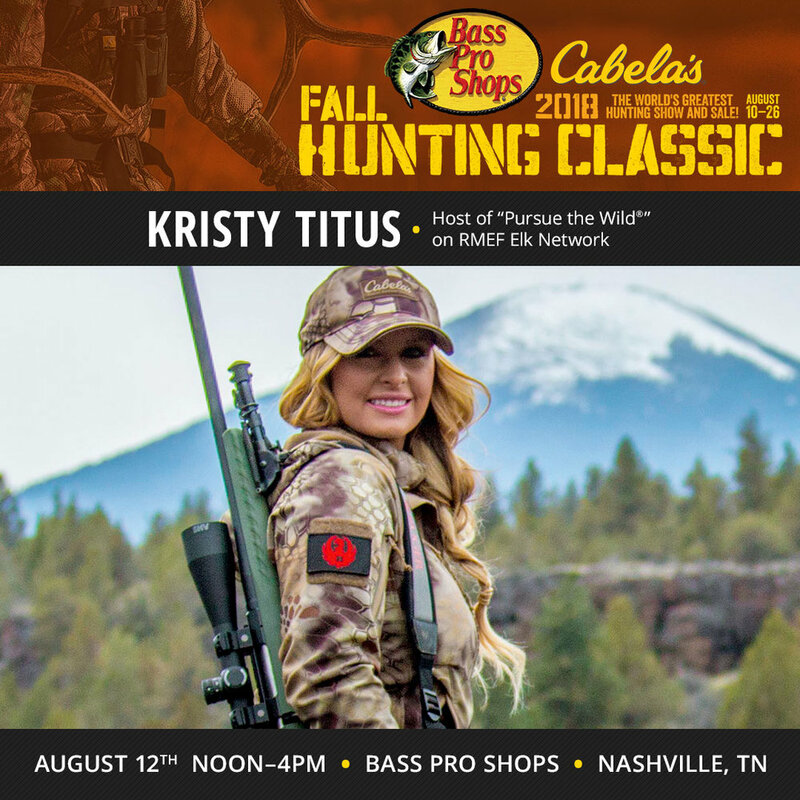 0:25 – Kristy’s extensive resume with hunting, shooting sports, and the NRA. 26:52 – Any crossovers between precision rifle shooting and hunting? As the leaves change in the Midwest and bold colors of fall paint the forest, we know it's coming. Anticipation fills our soul. Soon the search will begin. And we will be there as hunters…waiting for moments. Join Kristy Titus in her latest episode of Pursue The Wild where she hunts the peak of the Whitetail rut in Missouri waiting for that perfect moment on a mature buck. When preparing for a hunt, archers are always looking for accuracy in their broadhead. In the latest episode of Pursue The Wild, Tips From The Wild, join Kristy Titus as she demonstrates the accuracy of the Ramcat diamondback. From field tip to broadhead there is no impact shift. Diamondback is the first fixed blade broadhead to truly fly like a field tip. She even strips the broadhead down from three down to no blades to demonstrate the aerodynamics from the concave scoop ferrel design. Calling and being a successful archery elk hunter is simply time on the mountain learning to judge elk behavior, what they are telling you with their vocalizations, and putting all of that information together to create the best strategy that you can with the information that you know at the time. In the latest episode of Tips from the Wild as part of the Pursue The Wild series, Kristy Titus shares a few general tips that will help increase your success this archery elk season. The haunting sound of an aggressive bull bugling echoes across canyons, penetrates into your soul, changing life as you know it; forever. Year after year, answering the call, elk hunters head deep into the mountains in the pursuit of bugling bull elk. Having hunted elk on public land for most of her life, Kristy Titus has made a lot of mistakes, costing her numerous shot opportunities and she’s had a lot of success as well. Every year, the mountain and the elk teach hunters something new keeping them humble in their pursuit. In the latest episode of Pursue The Wild, Tips From The Wild, Kristy Titus shares a few hard learned lessons that she has encountered over the years as well as some great tips that will help you become more successful at hunting elk. Many hunters often wait for peak rut to start hunting elk. But there is a tremendous advantage to be had using summer pattern to locate bulls that are in bachelor herds or solo. In the latest episode of Pursue The Wild, Tips From The Wild, Kristy Titus shares some of her top tips and strategies that she has learned while afield pursuing elk solo on public land and with family, friends and some of the most accomplished elk hunters in the country. In the episode, Titus discusses creating the frenzy to call in a pre-rut bull elk, team strategies, solo hunting strategies, and more. When it comes to archery hunting, often times our chance at a big game animal happens quickly. In the latest episode of Pursue The Wild, Tips From The Wild, Kristy Titus talks about familiarizing ourselves with our equipment and identifying our individual max point blank. When the shot of a lifetime presents itself, be ready. The Pursue The Wild elk call series by Rocky Mountain Hunting Calls features Kristy Titus's signature series of elk calls. Proven performance afield. The Wild Frenzy Bugle Tube featuring Volume Enhanced Tone Technology (V.E.T.T.) as well as our tried and true Tone Selector. With the V.E.T.T. system the bugle tube creates true, easy to obtain bull elk sounds. The Tone Selector on the end of the bugle tube allows you to change the amount of volume projected and control the back pressure on your diaphragm. These two specialized features help you obtain the most realistic bugles possible. The Wild Fury Diaphragm features the new plastic palate plate top that is designed with a slightly narrower frame for youth, women and men with a narrow palate area. This call is very responsive for nasal soft mews and chirps of cows and calves. Also, a great call for a full range of bull elk bugling sounds. The Ignite-Her-Wild Cow call an open reed call for cow/calf call for making mews, chirps and estrous tones. The series of calls provide hunters the opportunity to create realistic bull and cow sounds. Shop the series at www.kristytitus.com under the Shop tab. The Precision Rifle Series Quiet Riot match is in the books. It was a great weekend shooting with old friends and new. My squad took three of the top six finishes. The shooting community has the best people that have truly been an inspiration and mentors to me. Even though we compete against each other, at the end of the day, it is about us running our gun. The team work that is exhibited here for this individual sport is incredible. My takeaway from this particular match was that I need to work on speeding up my set up and target acquisition. Once, I am there, my hit ratio is outstanding I am just timing out before I can get through the stages but that will improve with time. I really cannot thank my coach and mentor, Jake Vibbert enough for being my coach and helping me become a better shooter and competitor.